Displaced women and children in at one of the spontaneous sites where internally displaced people have gathered in Paoua town, Central African Republic. With more than half the population in the Central African Republic (CAR) projected to need humanitarian assistance in 2018, the United Nations, the Government and partners are seeking $515.6 million in contributions to address the crisis. “The situation requires greater attention more than ever,” said the UN Humanitarian Coordinator, Najat Rochdi, at the launch of the 2018 Humanitarian Response Plan on Wednesday. 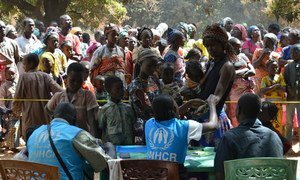 The UN Office for the Coordination of Humanitarian Affairs (OCHA) notes that due to violence perpetrated by armed groups, more than one in four Central Africans is either internally displaced or a refugee. The number of internally displaced persons has increased by more than 70 per cent since the first quarter of 2017. This has prevented thousands of children from enjoying their basic right to education. The combination of these factors means that 2.5 million out of the total 4.6 million Central Africans will need humanitarian assistance in 2018. In 2017, thanks to the support of donors and the unwavering commitment of the humanitarian community, $255 million has been mobilized to deliver food assistance to those in need. Over 60,000 children benefited from assistance, particularly educational activities in displacement sites and host communities. Generous contributions have permitted “the return of smiles on the faces of these children,” she said. Ms. Rochdi called on the international community to go an extra mile in their commitment to ensuring a better future for the children, women and men of the country.